How many times nowadays does one see in cafés or restaurants people talking not to people present, but text-messaging to people absent? Even I, who am no technophile, begin to feel anxious if I am separated too long from my e-mail or my mobile phone. Yet earlier in my life I was perfectly content to go months in remote locations without any possible contact with my friends, certain in the knowledge that the friendships would persist through the silence. Technology (as well, perhaps, as time) changes character, but not necessarily in the direction of depth. I feared Obama's tenure would be disastrous; I didn't expect his political shamelessness. Foolish of me. NPR, as a reader emailed and as I noticed myself, has been all over the Occupy movement in the most charitable of ways. The contrast with the Tea Party — both in terms of the behavior of the participants, and the tone of the media coverage — is stunning, even to those of us jaded by past performances. This is what jihadists call "respecting women." (And I bet some ultra-Orthodox Israeli Jews would agree.) We should call it by its true name: slavery. In the great scheme of things the Muslim world is of minor importance to America, and its disintegration will make that plain over time. Far more important are our relationships with India and China. And these depend on the perception that America is the undisputed world hyperpower, such that it is pointless to test our patience. That means more military spending, not less. . . . There will be occasions when our national security interests require us to stir up troubles rather than mitigate them. Talk to rank-and-file conservatives about such a matchup and they grow giddy, like nerds asked if they’d like to see a battle between Darth Vader and Gandalf the wizard. One of the all-time great lines in punditry. 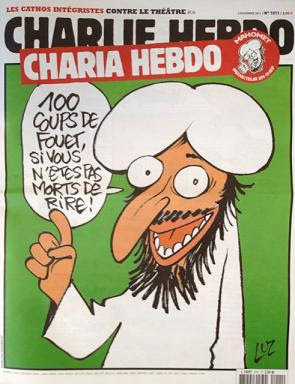 Translation of the text (via Google): "100 lashes if you don't die of laughter!" At The Corner, Michael Walsh quotes the Paris bureau chief for TIME asking Charlie Hebdo's editors (my paraphrase), "Happy now? Was it worth it?" 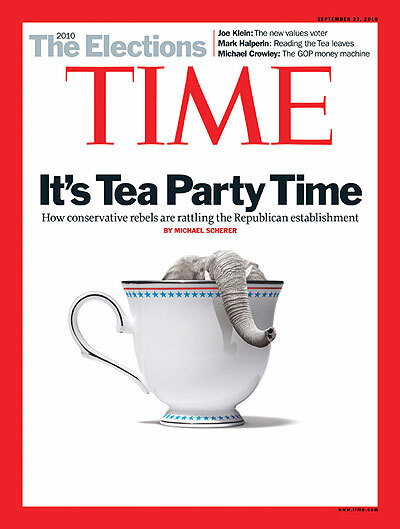 Think he'd have written similarly had Tea Partyers destroyed TIME's headquarters over this cover? Later: More on the bombing and the reaction to it. [R]eplacing a progressive income tax with a flat tax necessarily means slashing revenues, raising middle-class taxes or both. Set the new flat rate at a level that can raise as much money as the current tax code and the middle class will pay more. People in the middle of the income spectrum, that is, will have to make up for the sharp fall in rates on high earners. Set it low enough that middle-class taxpayers pay the same as they do now and revenues drop. The only way around this dilemma is to assume that the flat tax will cause an implausibly large boost to economic growth. . . . The flat tax may seem simple, efficient and appealing, but it’s the fool’s gold of conservative politics. Mark Steyn on why “pessimism is the way to bet” regarding government spending. His bleakness is justified. We need to put Republicans in charge of Congress and the White House, and then pressure them ceaselessly to eliminate the deficit. The Democrats will spend us into oblivion. With Republicans there's a little hope. But not much. William Jacobson on tactics the leftist media are using against Cain.